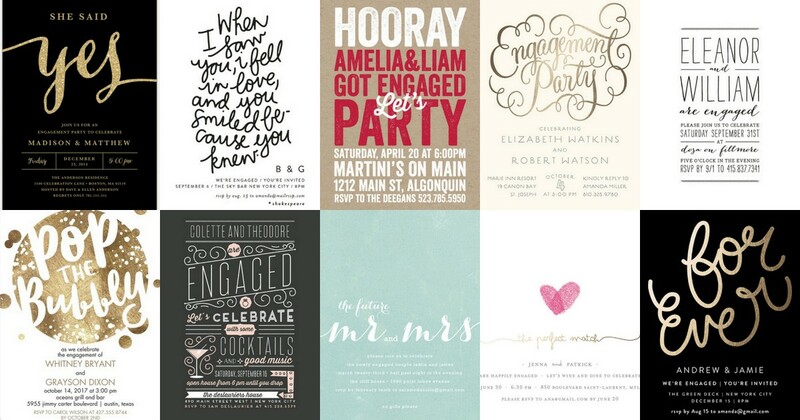 22 Engagement Party Invitations You'll Want to 'Say Yes' to! 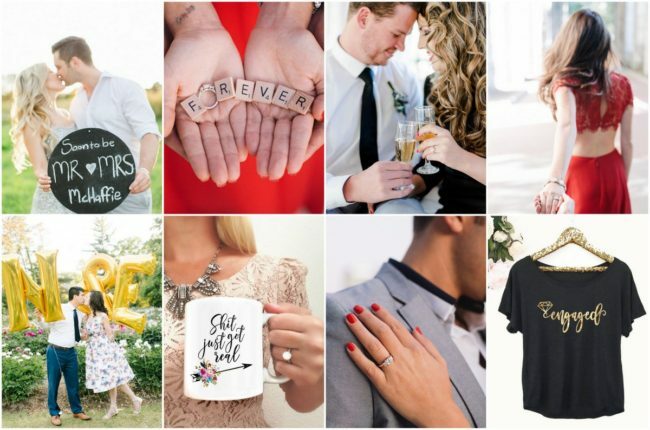 The question has been officially popped, you’ve said yes, and now it’s time to celebrate the news at your engagement party! 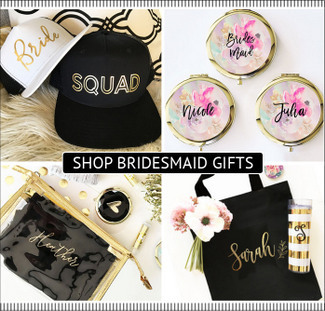 YASSS – you’re ready to send out those engagement party invites! 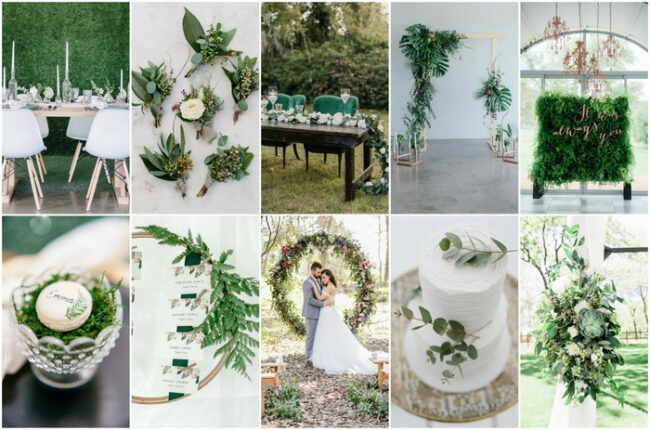 To help get your engagement party started in style, we’ve compiled an exclusively curated list of engagement party invitations for all tastes and budgets. 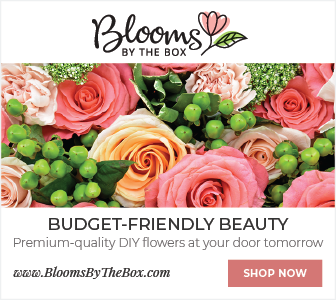 Find beautiful, luxe, printed invitations for your engagement party, or if you fancy the DIY engagement invite route, look out for downloadable engagement invites included below. 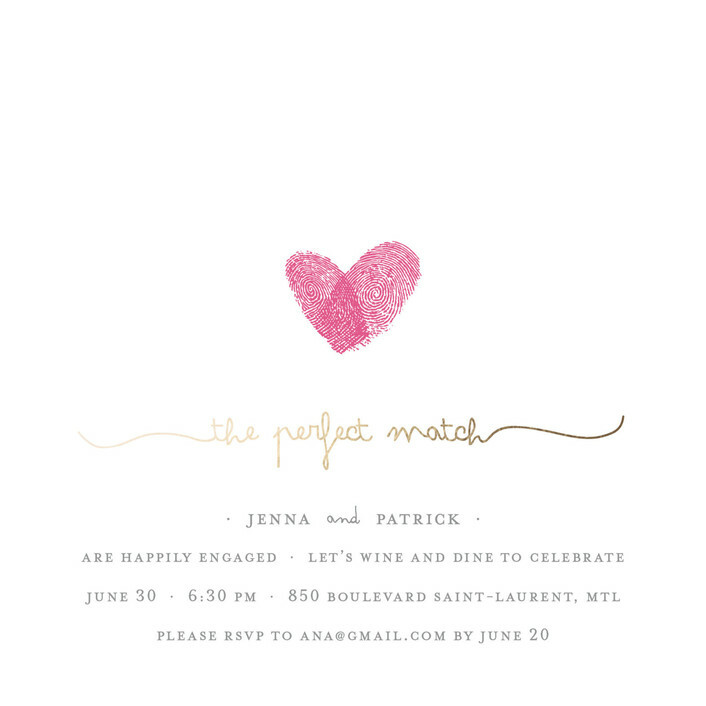 These digital engagement invitations can be printed at home instantly on paper of your choosing, or even sent as an attachment! 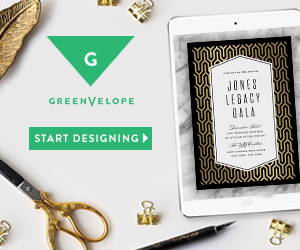 Decide if you’d like to purchase fully printed invitations, download a digital engagement party template for printing at home or use digital invites with automated RSVP tracking using a service like greenvelope. 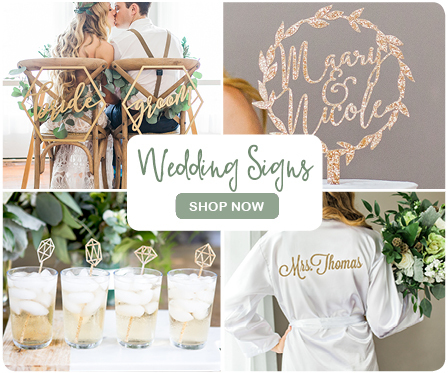 Browse designs, and click through to your fave invites. 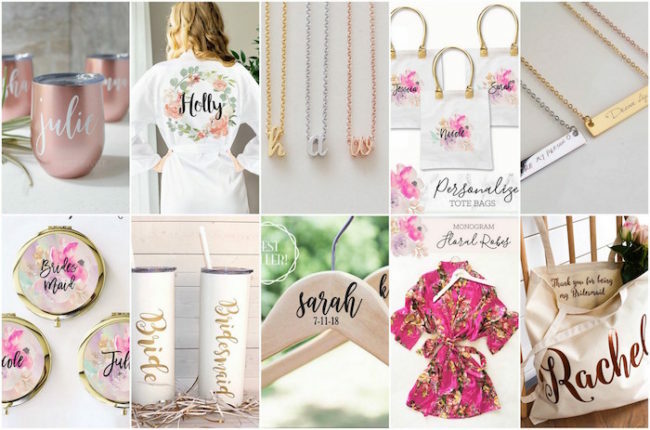 Engagement invites aren’t generally considered party of your official wedding stationery suite, so choose a design you love without feeling like your engagement party invites have to match the rest of your wedding stationery. 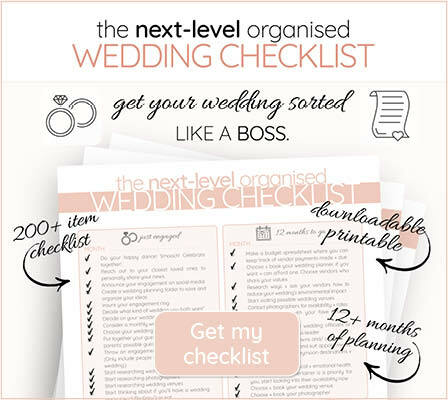 Nobody expects you to have already settled on your entire wedding design theme upfront! Check out order lead times, and rush order fees, if needed. Take a look at the customization options and select your preferred options – some designs are available in multiple colors, or on various paper types. 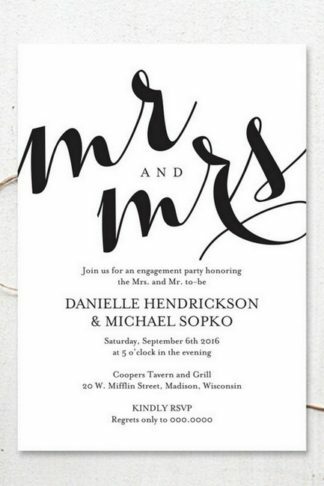 Remember, you should only send out engagement party invites to guests whom you intend to invite to your wedding! Learn how to plan an engagement party here . 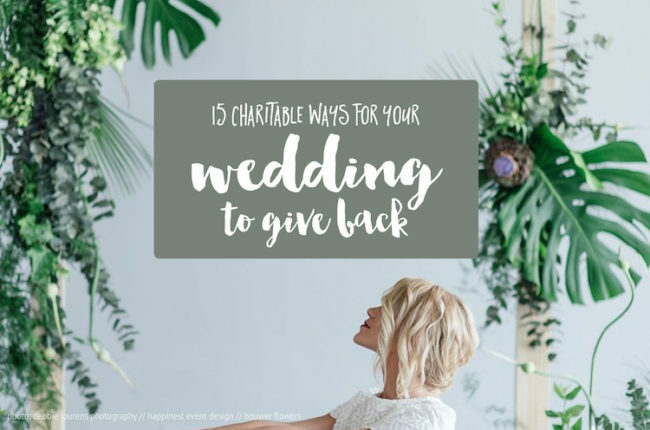 Go ahead and take a read through all of our insightful wedding planning advice to guide you through your journey here, too. We’ve hand picked these invites and hope you adore them just as much as we do! If you fall in love and make a purchase, we’ll get a small referral for sharing them with you. Happy reading! (Above Left) “For Ever” engagement party invitations with modern gold swirly script style text by Phrosne Ras that are perfectly whimsical. Order them online here. // (Above Right) These Flourished Foil-pressed Engagement Party Invitations by Laura Bolter Design are playful and pretty. We love how they sparkle! Available online here. (Above Left) You Smiled Because You Knew Engagement Party Invitation. These invites are whimsical, funny and bold! Grab them from Phrosne Ras online here. // (Above Right) How pretty are these ‘The Future Mr. and Mrs.’ Modern Invitations for Engagement Party! Order this minimalist design available in a number of color choices, here. (Above) She Said Yes Engagement Invitation. 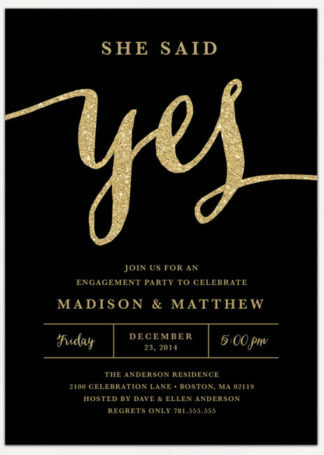 Available to order as a digital download for home printing, or as fully printed invitations delivered to your doorstep, these black and gold, glitzy invitations can be purchased for your engagement party online here. 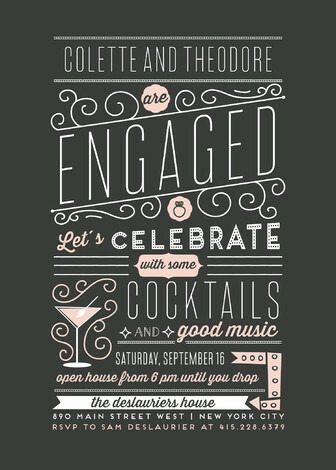 // (Above) Printable Engagement Party Template. Download this Mr and Mrs Invitation for your engagement party and print it right at home on cardstock of your choosing to match your color preferences. Available online here. 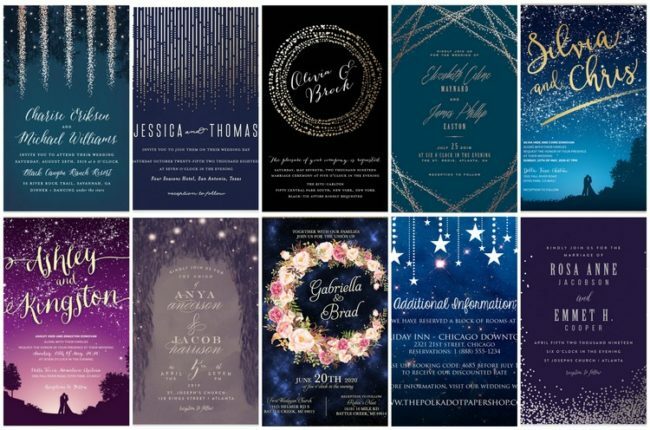 (Above) These dreamy Garden Lights Engagement Party Invitations are perfect for an outdoor or backyard soiree in the garden under the startlit trees! 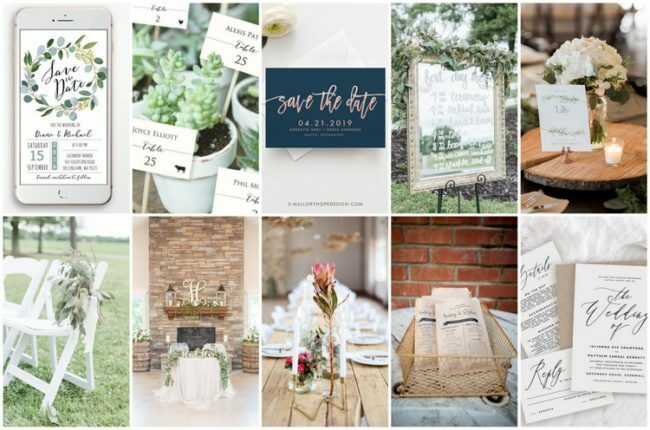 Grab these rustic, whimsical invites from Hooray Creative here. 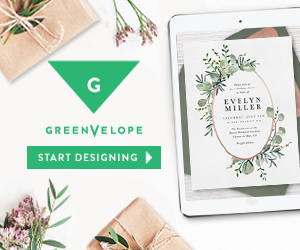 (Above) Use an online engagement digital invitation service like Greenvelope which not only allows you to customise ready-to-edit templates, but also sends and manages your guest RSVP list tracking. 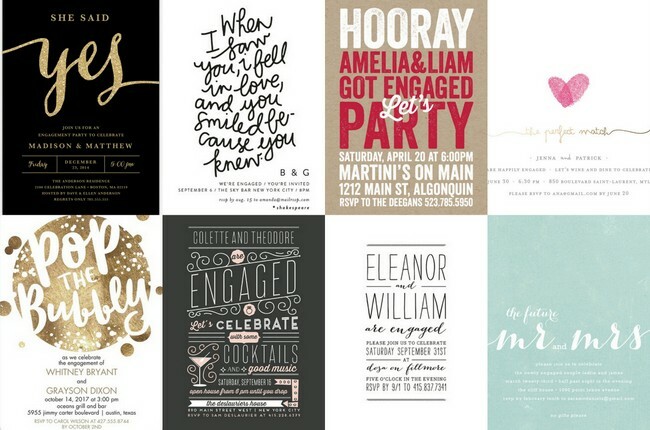 (Above, Row 1) Downloadable Engagement Party Invites. Pop Fizz Clink! 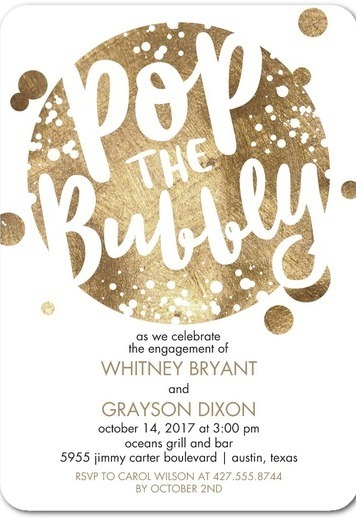 It’s time to break out the champagne and celebrate your engagement with this easy printable engagement invites from Bliss Paper Boutique. Get them here. 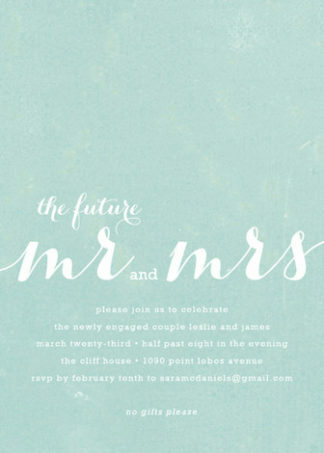 // (Above, Row 2) Printable DIY Engagement Party Invitation. 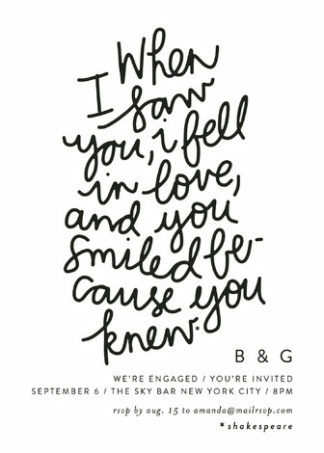 Let the world know ‘We’re Engaged’ with this elegant handwriting-style engagement invite with cute ring illustration which can be instantly downloaded for printing after purchase here. (Above) Digital Engagement Party Announcements Download. This modern calligraphy invite with whimsical heart design is instantly downloadable for home printing on paper of your choice. Try printing on Kraft paper for a rustic look, or plain white cardstock for a clean, modern look. Purchase them instantly here. 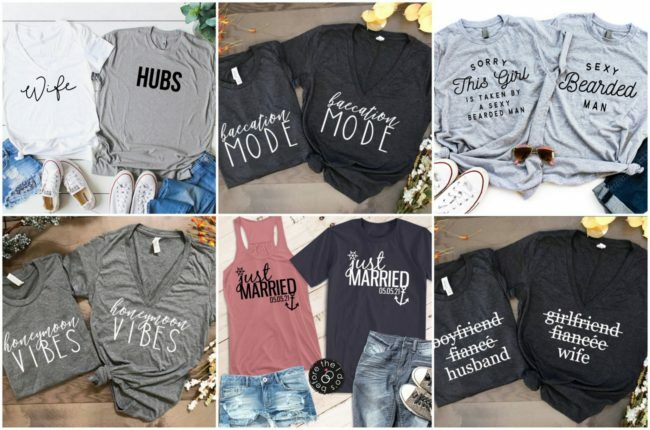 (Above Left) ‘Hooray we got engaged’ invites to announce your engagement party. 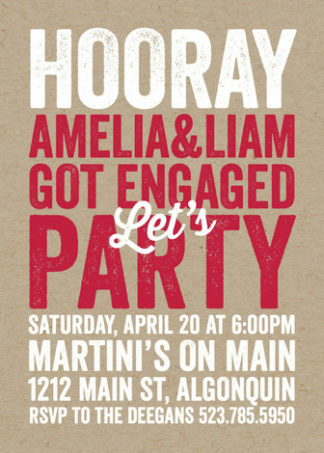 These fun, rustic engagement invites designed by Erin Deegan can be ordered here. // Above Right: It’s all about the love! 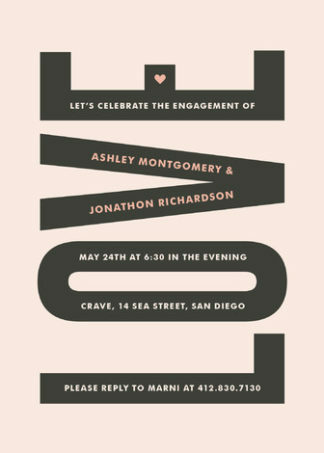 Grab these ‘In Love’ Modern Engagement Party Invitations by Kim Dietrich Elam, available in a three colors, here. 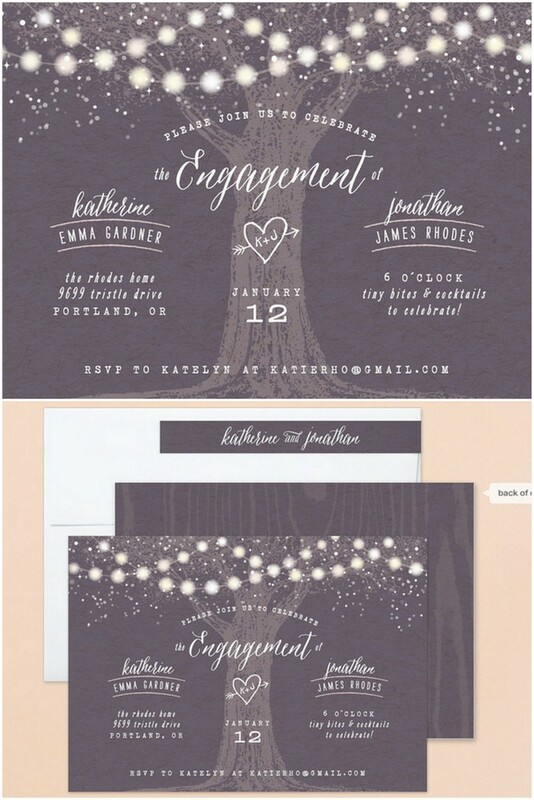 (Above) Thumbprint heart engagement party invites. The perfect match! 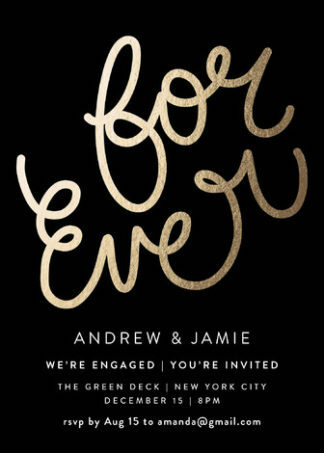 Share the news of your engagement party with these ultra cute foil-pressed invites with sparkly gold foil by Angelene. Order online here. 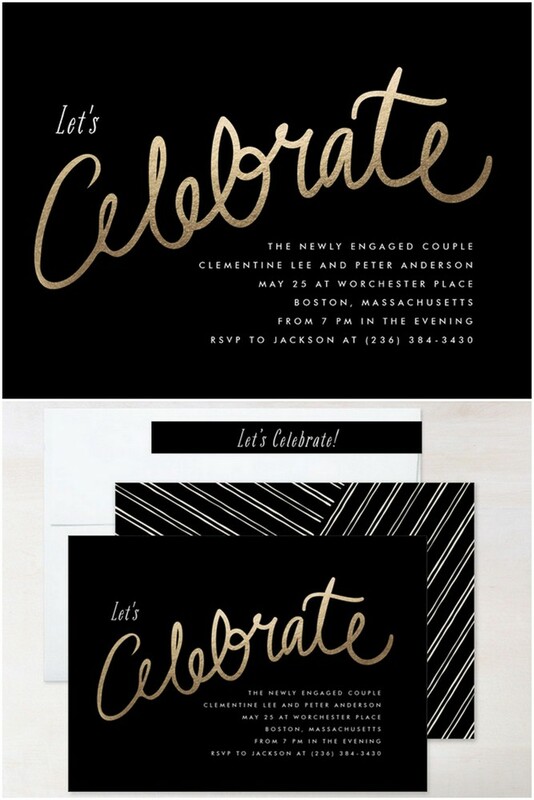 (Above) Let’s Celebrate Gold and Black Engagement Invitation Cards. 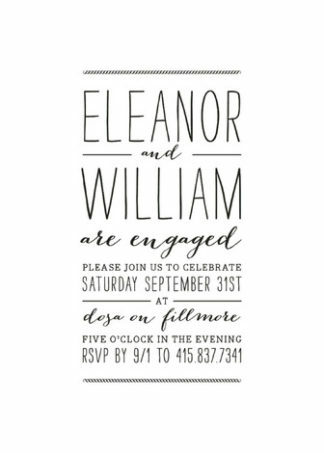 These elegant and some what whimsical Foil-pressed Engagement Party Invitations by chocomocacino are available to announce your newly engaged status here. (Above Left) Funny Engagement Invite. ‘At long last, Jackson and Stephanie are engaged! 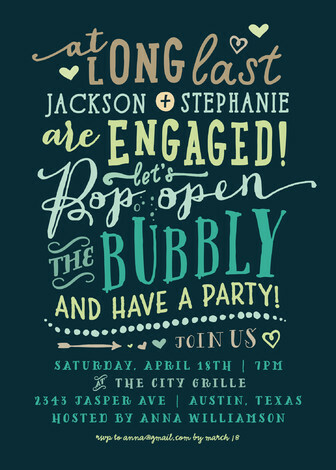 Let’s pop open the bubbly and have a party!” Grab the cute, whimsical invite designed by Rebecca Bowen here. It’s available in a choice of three colors, too. // (Above Right) “Cocktails and Music” Vintage Engagement Party Invitations. “Colette and Theodore are engaged. Let’s celebrate with some cocktails and good music.” Check out these retro chic invitations for your engagement party by Bonjour Paper here. 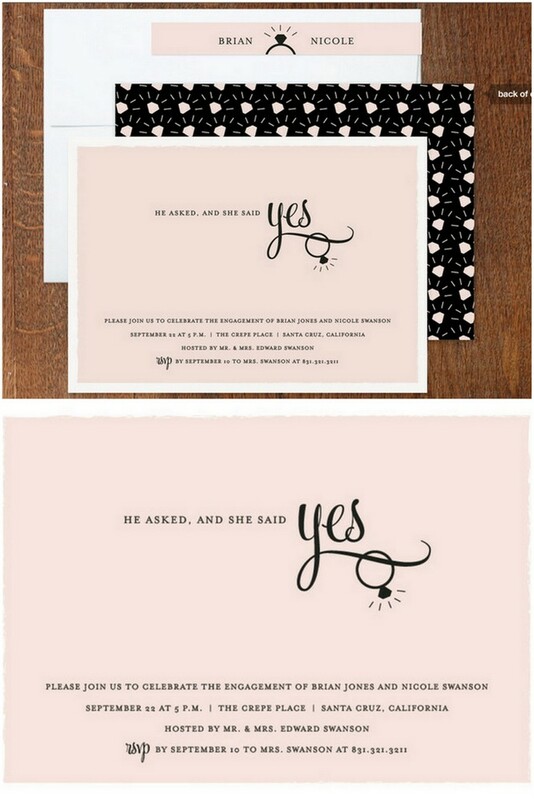 (Above) He Asked, She Said yes – Formal Engagement Invitation Cards. Simple, sweet and to the point. 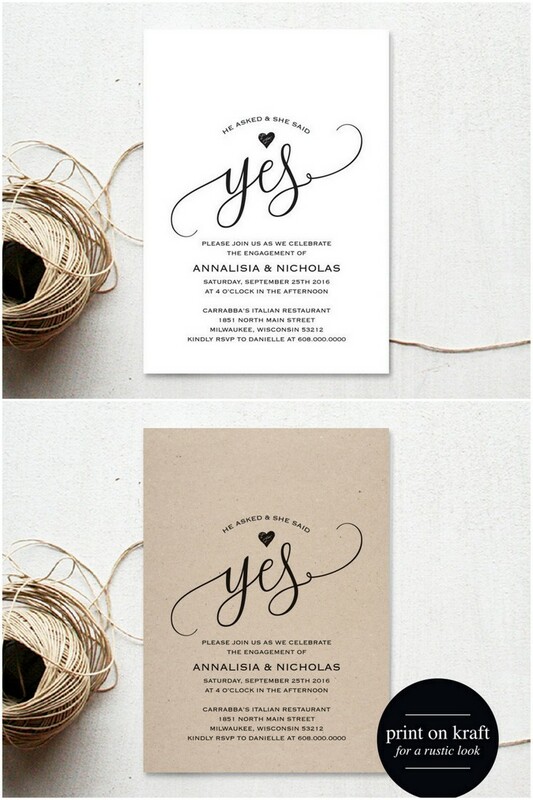 Less is more with these adorbs little engagement invite cards from Sarah Curry available in three shades. 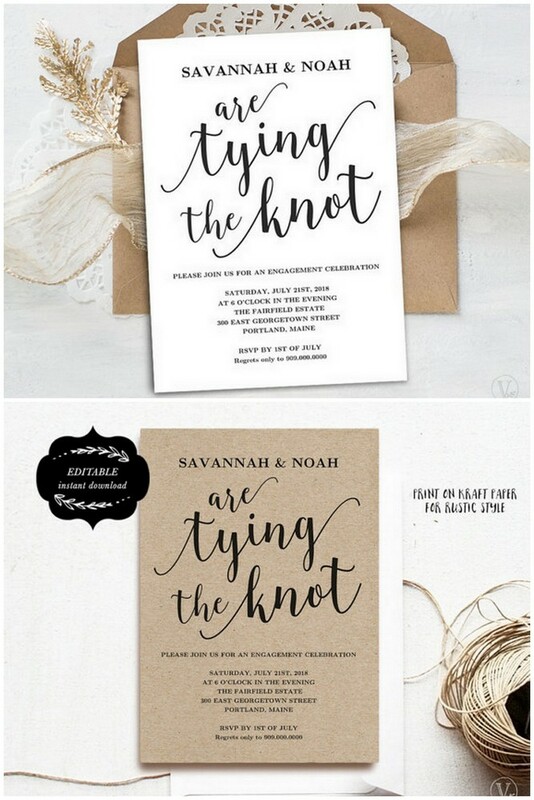 (Above Left) Finally Engaged Funny Engagement Party Invitations. After many years together it’s finally time to make it official! 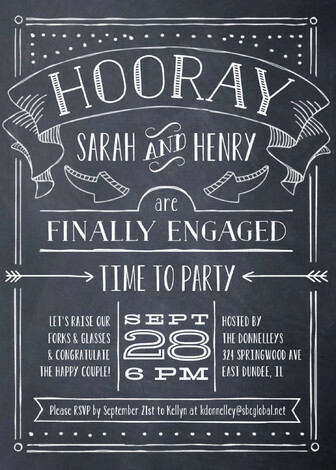 These chalkboard engagement invites let your guests know that it’s time to party. Available from Erin Deegan here. 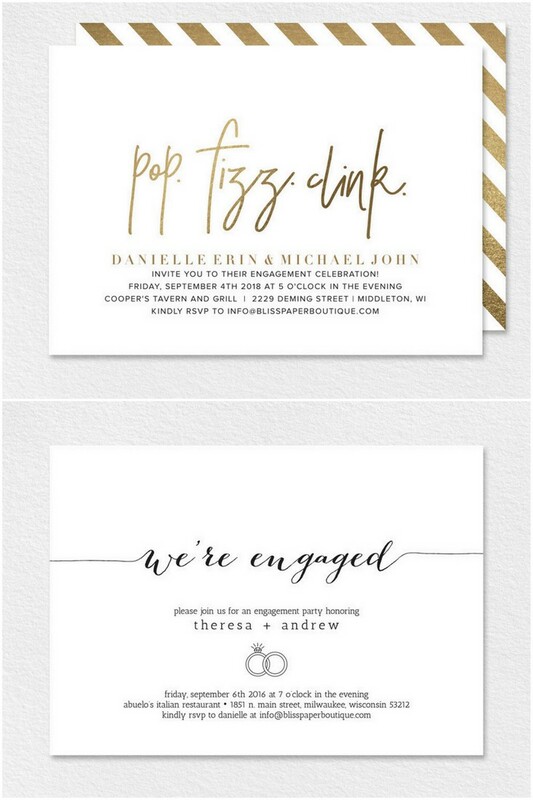 // (Above Right) Pop the Bubbly Fun Engagement Invitation. We love the bold gold of these invitations, but you can choose your own colors, paper and edging when you order them online here. Instant Download Engagement Party Invitation Template. 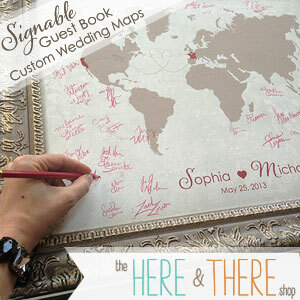 Let your guests know ‘We’re tying the knot’ with this printable Engagement Announcement that has editable text. Buy this modern calligraphy invite online here, then print from home DIY style on paper of your choosing. So easy! 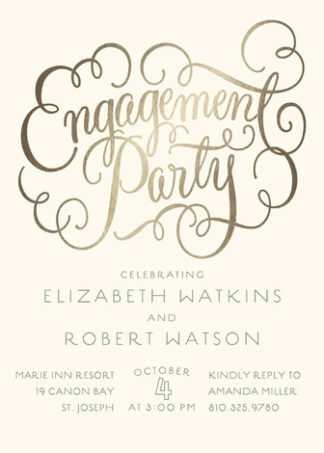 (Above Left) Typography Style Modern Engagement Invites. Bold with elements of modern calligraphy, we love these invites designed by roxy. Grab them for your party here. 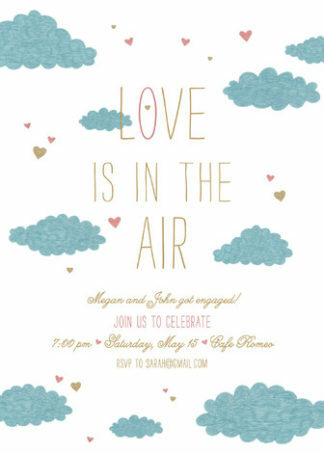 // (Above Right) Love is in the Air Funny Engagement Party Invitation. You’re floating on cloud nine, skies are clear and hearts are filled with love – grab these invitations for engagement party by Lori here.